Apologies – due to some technical difficulties, we have been off-line for what feels like forever. However, all is now sorted and the blog gremlins have finally been banished – hurrah! 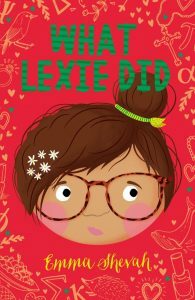 To celebrate, I thought I would post a quick review of Emma Shevah’s latest book: What Lexie Did. It caught my eye as, having a background in diversity and inclusion, I love reading books that give an insight into different communities and their culture, values and traditions. This is one big-hearted, warm, funny story with a moral basis. I like stories that make children stop and think – how would they handle the same situation? – and this does exactly that. On the face of it, we all think that telling the truth is very straight-forward, but as the book makes clear, there are lots of shades of grey and it’s difficult for children to understand these nuances. The story also highlights how lonely you can be, even when you are constantly surrounded by family and friends. While there are a number of poignant moments in the book, they have been cleverly counter-balanced with humour and the Greek love of food (and there are some fab recipes included too!) which keep the story from going too deep; I also liked the deceptively simple illustrations, which frame each page in the style of a book journal.